This one is pretty simple. You need horns, ears, furry pants and a scarf. My current set up includes the faun pants we have available on our faun costume page, some curved horns and our large elf style ear. I swap out scarves depending on how I feel that day. I also normally carry around a over the shoulder leather bag to keep various articles (fauns in Narnia didn’t need cell phones or wallets I guess). Another problem with a good faun set up is the foot. With Narnia and now Pan’s Labyrinth, people are expecting fauns and satyrs to have the goat style leg. 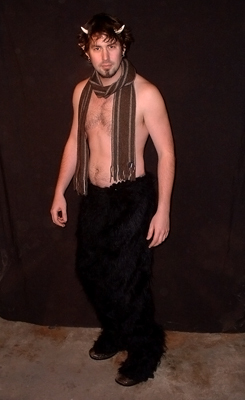 The only comfortable way to do this is to have the fur pants a little longer than needed and to stand on your tip toes during photos. In the photos am just wearing some square toed brown shoes which seems to make people happy enough (but not me, being a perfectionist). Since these photos were taken we have finished the faun hooves which can be bought here. For my Pan’s Labyrinth Faun costume click here. The faun (Latin: faunus, phaunos, pronounced [p?aynos]) is a mythological half human–half goat (from the head to the waist being human, but with the addition of goat horns) manifestation of forest and animal spirits that would help or hinder humans at whim. They are often associated with the satyrs of Greek mythology. Romans believed fauns inspired fear in men traveling in lonely, remote or wild places. They were also capable of guiding humans in need, as in the fable of The Satyr and the Traveller, in the title of which Latin authors substituted the word Faunus. Fauns and satyrs were originally quite different creatures: whereas fauns are half-man and half-goat, satyrs originally were depicted as stocky, hairy, ugly dwarfs or woodwoses with the ears and tails of horses or asses. 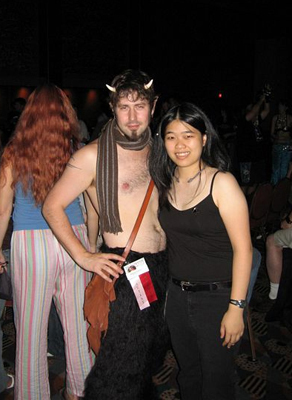 Satyrs also were more woman-loving than fauns, and fauns were rather foolish where satyrs had more knowledge. Ancient Roman mythological belief also included a god named Faunus often associated with enchanted woods and the Greek god Pan and a goddess named Faunawho were goat people.